Homeworld is one of my favorite games ever, so I'm interested in pretty much any real-time strategy game with screenshots of capital ships carving each other up with lasers in outer space. The trailer for Flagship has all the lasers, engine trails, and spacey skyboxes I'm looking for, but it also has a fantastic twist near the end that makes it different from any RTS you've played to date. You play Flagship from the first-person perspective. Unlike Homeworld and other RTS games where you're hovering over the battlefield in a disembodied perspective, in Flagship you're commanding your fleet from the bridge of your ship. The FAQ on the game's official site also describes a bunch of other different scenarios that you've probably thought of as well as you were watching the trailer. 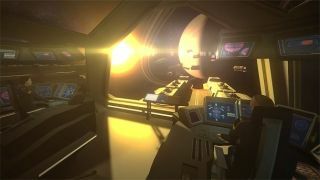 Flying smaller ships yourself and boarding enemy ships, for example. The game is still in pre-alpha, so it's far too soon to tell how and if all of this will work, but I hope Urban Logic Games can pull it off. It's an idea with so much potential.